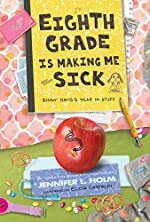 Eighth Grade is Making Me Sick by Jennifer L. Holm. Review: Are you in eighth grade? Do you like reading about people your own age? If your answer to those questions were yes, then you would definitely love the book Eighth Grade Is Making Me Sick by Jennifer L. Holm. Ginny Davis is starting eighth grade and she has a lot of things she wants to accomplish this year. She wants to tryout for cheerleading, convince her mom to let her bike to school, work on art, look good in her family's Christmas photo and much more. Some of these things don't work out for her, but some work perfectly and some work, just not the way she had expected. For example, she wanted to have a cool Halloween costume but ended up being a worm! Join Ginny as she goes through many hardships with her family and at school. Eighth Grade Is Making Me Sick was not one of my favorites. The beginning doesn't really make sense and there are a lot of confusing parts. It really wasn't what I had expected. I got home to start reading and I found out it isn't like a normal book. It is made out of letters and pictures and texts. Some ideas were not clearly explained or seemed really random! For example, one letter is explaining that a refrigerator broke. It is signed Òthe management.Ó I had no idea who the management was! I eventually guessed that it was Ginny's mom. Although 8th Grade is Making Me Sick is targeted to readers ages 12 and up, I think that this book is not appropriate for anyone below eighth grade. It could be viewed as inappropriate. Eighth graders might be able to connect with it but I couldn't. Personally, I prefer a traditional book, and I did not like how this book is organized. We would like to thank Random House for providing a copy of Eighth Grade is Making Me Sick for this review. Have you read Eighth Grade is Making Me Sick? How would you rate it?